Is it possible to walk from Elgol to Loch Coruisk? There’s a well trodden coastal walking route from Elgol to Loch Coruisk along the cliff top taking in Glen Scaladal, the beautiful bay at Camasunary, round the slopes of Sgurr na Stri and taking in the notorious Bad Step before reaching the head of the sea loch at Scavaig. It’s then a short walk to the freshwater Loch Coruisk. I’m sure I’m not alone in considering this walk from Elgol to Loch Coruisk as the most scenically spectacular coastal walking routes in Britain. Where else do you get views of a 12km continuous ridge of 1,000 metre peaks rising directly out of the sea forming a crater like mountainscape? There’s off shore islands, a huge horizon and seascapes as well as the chance of encountering some of Skye’s amazing wildlife, including golden eagles; the Cuillins are part of an area designated a Special Protection Area for this species. The route from Elgol to Loch Coruisk is fairly hard going and should not be under estimated. Initially it runs along a narrow cliff top path then several stretches of boggy moorland have to be crossed as does a lively river. And, after all that there’s the Bad Step to negotiate. But the reward is seeing the mountains get closer and closer and then, on arrival, enjoying the majestic but slightly forbidding atmosphere of Loch Coruisk, a freshwater loch in a rock basin scoured out by glaciers. There’s also good swimming, either at the low-tide sandy beach at the head of the sea water loch, or near where the boats land on the far side of the sea water loch. Do I have to walk both ways? But first things first. Unless you want to walk BOTH ways, it makes sense to BOOK a place on one of the boat trips RETURNING from Loch Coruisk to Elgol in the late afternoon. Do this by contacting either Misty Isle Boat Trips or Bella Jane Boat Trips BEFORE you start your walk to ensure that you’ll get a ride back. The walk from Elgol to Loch Coruisk starts near the top of the hill on the Broadford to Elgol public road as it drops down to the shore. Follow the track past several houses until it comes out onto the moorland. A path is readily distinguishable and follows the cliff top above the shore to Glen Scaladal and then on to the beautiful Camasunary Bay. Ford the river at the far end of the bay. It’s shallower higher up but can be tricky after rain or at high tide. Sometimes it’s quicker to take your boots off and paddle across a slow moving stretch. From Camasunary follow the path round shore line at the foot of the small mountain, Sgurr na Stri. The path climbs up over a low shoulder of the hill and then drops down to the shore again where you will encounter the Bad Step – a crack in a huge rock that has to be traversed above the waters of the loch below – daunting, perhaps, to those of a nervous disposition but if you got this far you are unlikely to be deterred by this tricky obstacle! Once across the Bad Step follow the waters edge to the head of the loch and aim for the narrow pass that forms the gateway to Loch Coruisk. There’s a path back from the loch side that will take you to the landing place on the far side of the loch where the boat taking you back to Elgol will be moored. Enjoy the hot drink served on board and soak up the admiring glances of your fellow passengers when the boat visits the Bad Step on the way back. Yeah, we did that – it was awesome! The walk is readily accessible direct from Springbank Cottage, our Skye self catering holiday cottage just nip out the back through the hill gate and over the small hill behind the house to pick up the coast path where the stream crosses it. There’s plenty of guide books and maps for guest to use at the house as part of our environmental activities offer. If you want more than just a “standard” holiday cottage, then take a closer look. 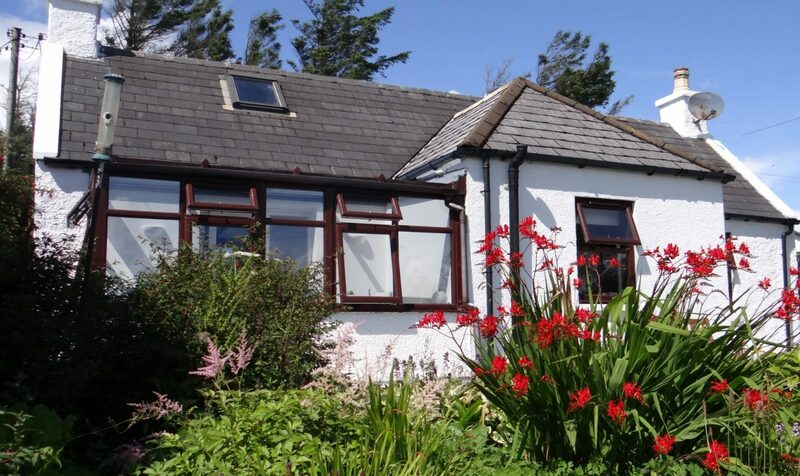 We hope you will be surprised by how much is on offer during a stay at Springbank Cottage. This entry was posted in Coastal Walking, Skye and tagged Bad Step, Bella Jane Boat Trips, Camasunary, Cuillins, Elgol, Elgol Shop, Golden Eagles, Isle of Skye, Loch Coruisk, Misty Isle Boat Trips, Seascapes, self-catering holiday cottage, Skye, Spingbank Cottage, walking, Wildlife by Matt. Bookmark the permalink.